Automatically have your Ruby call data, messages, and voicemail sent to your Rocket Matter account, making it easy to associate client communication with specific cases and matters. You’ll save time and get more done with all your clients’ details in one place! 1. Login to Ruby Receptionists customer website and click on “Integrations”under the Accounts section. 2. Select 'Rocket Matter' and click the “Authorize” button and you will be redirected to Rocket Matter to enter your Rocket Matter username and password to complete the authorization. Once authorized, you will be redirected back to the Ruby site. 6. 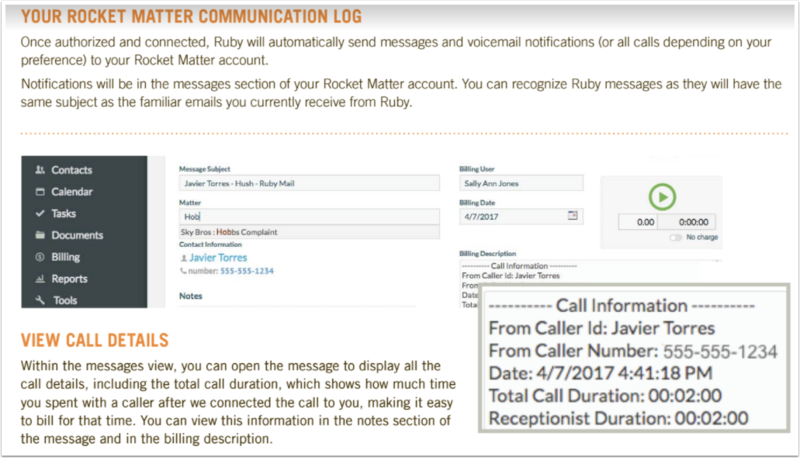 Once authorized and connected, Ruby will automatically send messages and voicemail notifications (or all calls depending on yourpreference) to your Rocket Matter account. 7. Add information to Ruby messages from the message detail view, you can easily assign amatter, update the billing notes, or forward to another userin Rocket Matter. Prev: Is there a report to see a high level view of my matters and their statuses? Next: How to update my password.